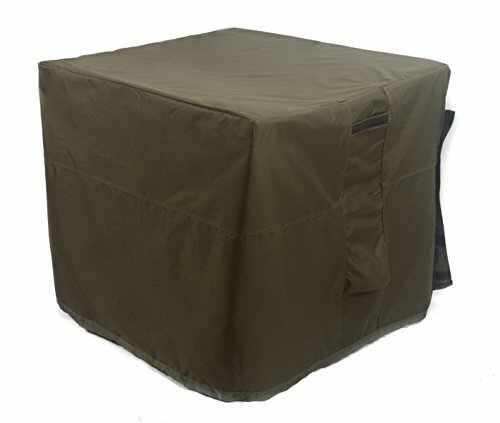 The Hybrid Covers heavy duty air conditioner cover is designed to help your outdoor air conditioner last longer and reduce maintenance caused by outdoor elements. Made from high quality durable fabric that will hold up year-after-year, our waterproof cover protects your air conditioner through every season. Fits most square outdoor air conditioning units 34" long x 34" wide x 30" high that measure 34” long x 34” wide x 30” high including: Lennox, Frigidaire, Trane, American Standard, Carrier, Bryant, Coleman, Amana, Goodman, Rheem and more. Air conditioner should not be used while cover is on. At Hybrid Covers, we’ve selected the best materials for our all-weather covers to provide superior protection. We carefully analyze feedback from our customers to design the highest quality covers. With a Hybrid Cover you can feel confident that your air conditioning unit will be protected and ready to use, year-after-year. If you have any questions about this product by Hybrid Covers, contact us by completing and submitting the form below. If you are looking for a specif part number, please include it with your message.